The folks in Bristol are getting a little defensive over those rather inconvenient comments made by Boston College AD Gene DeFilippo, who said ESPN had influenced the ACC's decision to expand by swiping Pitt and Syracuse from the Big East. An unnamed spokesman for the Worldwide Leader has already issued the requisite denial to the New York Times, but the story has gained such traction since first being published in Sunday's Boston Globe that ESPN felt the need to take its case a step further by completely misrepresenting the statements of two people who had nothing to do with any of it. 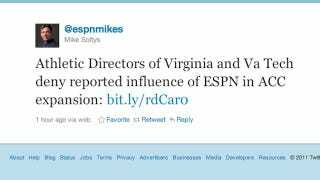 Did ESPN Bone The Big East Because They Wouldn&apos;t Sign A TV Deal? "Maybe there was some input from ESPN that I don't happen to know about." Something else Soltys might have noticed had he actually read the Daily Press's story: Neither Littlepage nor Weaver was on the ACC's expansion panel. But DeFilippo was.